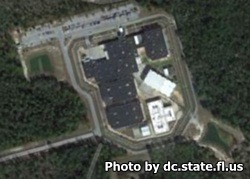 Bay Correctional Facility is located in Panama City Florida. It is a level III facility that houses approximately 980 male adult inmates. The custody levels housed at this institution are minimum to medium. This facility does not currently participate in any PRIDE assignments. Inmates incarcerated at Bay Correctional Facility can take substance abuse education courses, adult basic education and GED classes. Additional vocational opportunities exist in the following fields: HVAC, architectural drafting, culinary arts, pc repair, veterinarian technician, and landscaping. Visiting is on Saturdays and Sundays from 9am-3pm. All visitors must arrive for processing no later than 2pm or they will not be allowed to visit. You can arrive at the facility parking lot no earlier than 7:30am, processing for visitation begins at 8:15am. All times are in Eastern Standard Time. Prior to visiting you must have completed a visitors application and it must be approved.